In today’s globalized economy, supply chains are growing longer and more complicated. As a connected set of processes that form the link between individual component sources and a final product, supply chain bridges the gap between suppliers and the ultimate end user. When it works, it is an impressive orchestration of many moving parts working together to deliver products to customers. However, one of the biggest challenges for supply chains that things won’t always go per plan, and therefore ensuring that the right mechanism is in place to sail through the unforeseen is becoming the highest priority for the business to meet the increasing customer demands. For any supply chain to function effectively, three essential elements are very crucial. It is important to note that these are transformational elements and when achieved, the impact on the organization can be significant. Supply chain visibilities starts with understanding customer demand, aggregating the demand of all the customers for a particular product and then have a complete visibility into the supply chain concerning fulfillment of the delivery. Backward scheduling can achieve this good visibility – understanding how much customers need, how much is in supply and how much extra needs to be produced. However, the real value is when visibility can enable early warnings about disruptions across the trading network to take necessary actions ahead of time – and ensure that operations and performance are not impacted negatively. Successful supply chains operate end-to-end and across multiple-tiers. Having visibility across the extended supply chain network at every tier is critical. Responsiveness is the ability of an organization and its partners to react to opportunities and exceptions in a consistent, unified and collaborative manner that delights customers and reduces supply chain costs. Awareness at the right time at the process execution level and an overall understanding of how the process execution fits into the overall supply chain flow ensures that businesses make the best decisions in the quickest turnaround possible. Awareness and visibility are the primary building blocks in gaining insight into the data that’s required at the right time. They are also critical in understanding the correlations between the supply production and customer demand. Being aware of and responsive to issues promptly is crucial. But there is a difference between becoming aware of an exception immediately and acting upon it immediately. A critical, yet often ignored function of responsiveness is to ensure that an organization and its partners are responding in the right time and not deploying maximum resources at every issue. When a manufacturer has a successful digital supply chain operation, it automatically introduces awareness and visibility into its process. Ideally, each and every part of the supply chain—from raw materials suppliers to factories to transportation providers—will collaborate on the entire process. Otherwise, they end up pushing their problems onto the next point in the supply chain, increasing costs and time to the overall process. By providing transparent data to the overall picture proactively, every point in the supply chain becomes aware of potential issues and can take action to resolve them as they occur—in a unified, seamless process. Analyzing various levels of risk and building in resilience is the next frontier in supply chain management. Supply chain resilience is the ability of an organization to bounce back in the wake of unprecedented supply chain disruptions due to man-made or natural disasters as well as inherent vulnerabilities like changes in consumer demand. Resilience ensures that organizations can effectively manage any exception or required change, while improving net margin, without compromising on the improvements to customer satisfaction or revenue growth. Resistance capacity is the system’s ability to minimize the impact of a disruption by avoiding it entirely or by reducing the time between disruption onset and the start of the recovery from that disruption, i.e., containment. Recovery capacity is the system’s ability to return to functionality once a disruption has taken place. The process of system recovery is characterized by a) stabilization phase post which a return to a steady state of performance can be pursued. The final achieved steady-state performance may or may not reach original performance levels, and is dependent on many disruption and competitor factors. Organizations have very little or no time to re-plan in the event of natural disasters or other large-scale disruptions. 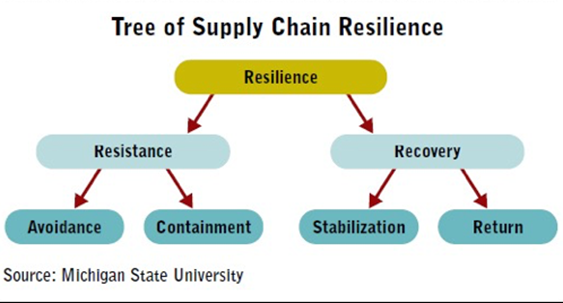 Supply chain resilience ensures an organization’s ability to identify risk probabilities, prepare recovery scenarios, and alter plans based on unexpected demand surges, and change supplier capabilities when the unexpected happens. In order to react effectively and swiftly, organizations must be able to quickly determine affected supply, the products comprising those components, the location of inventory within the whole network, and options for alternate supply. It’s being agile enough not to be paralyzed by disruptions by understanding quickly and responding promptly. Organizations are seeking the help of technology to ensure resilience in their supply chain, with a greater emphasis on protecting organization’s brand, reputation, assets, and data. With the presence of technologies such as in-memory computing and improved analytics algorithms, companies can now analyze complex supply chain questions that took days or weeks, in a matter of minutes or hours. The speed of analysis and data precision are both valued greatly for companies pursuing resilient supply chains.